Vsbattles Wiki Exposed: They placed Pre-Retcon Beyonder at Beyond Omnipotent! A registered-source only wiki that is built upon stolen concepts (They stole from a Russian Wiki called Anime-Fight Club which just like Vsbattles Wiki is biased against comics) and known for stealing loads of information from Outskirts Battle Dome and Google+ (from my friends) and trying to pass it as if they know the information themselves until people debunk them and either the thread is closed or the user is banned for debunking them. Now, why this post? Well Vsbattles is known for having massive HATE against a fictional character known as Beyonder mostly his original form aka Pre-Retcon. But then 100% contradict themselves and state he is BEYOND OMNIPOTENT level. 1. They take unproven statements as facts. (example: Because reed "speculated" Beyonder is restricted by time then it's a fact even when being a mere unproven statement.) And so they nerfed him for it. 3. They don't consider him by their flawed dimensional tiering as "Tier-0" even when being stated MULTIPLE times to be beyond all things but to them yet again "Our opinion on vsbattles is more factual than the comics." Now you can use this anytime you want if you see people using illogical terms like Outerversal or Hyperversal or that Metaverse nonsense. 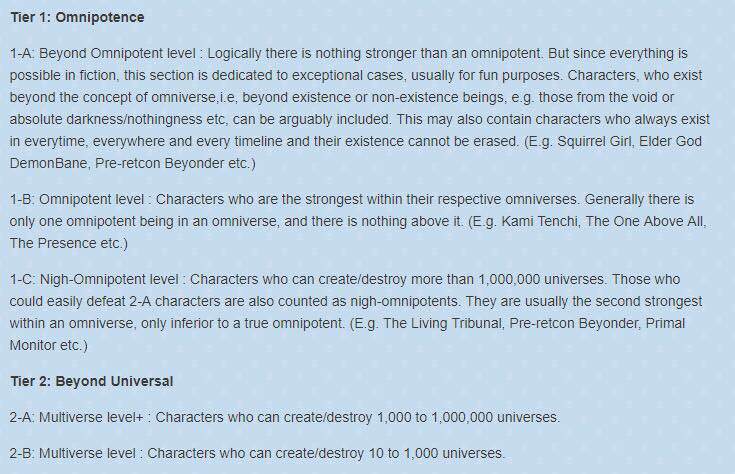 Just to inform this was before their rip-off concept of Dimensional tiering was established to excuse "Omnipotence" as a feat since they know Anime doesn't have any and doesn't like how comics do. Re: Vsbattles Wiki Exposed: They placed Pre-Retcon Beyonder at Beyond Omnipotent!